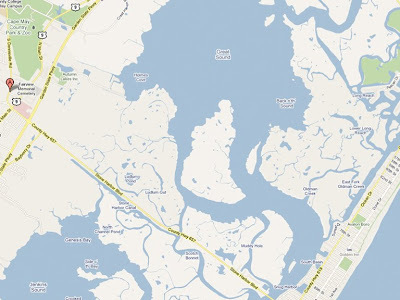 Second to last stop on the Jersey Shore Tour... Sea Isle City! 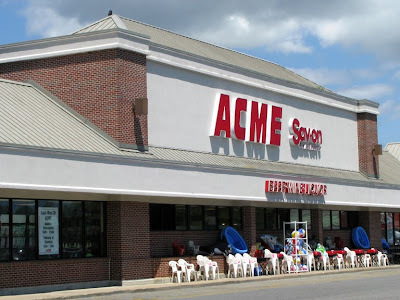 One of the few classic 50's Acme still in existence. 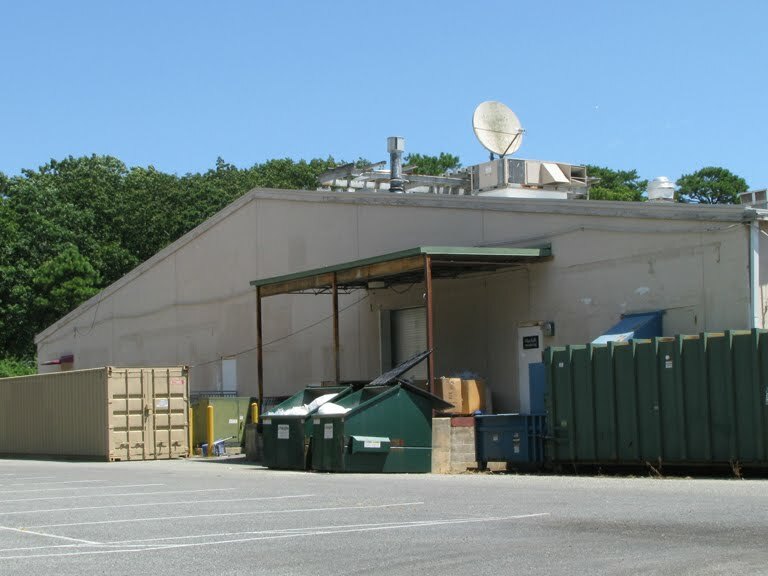 Also one of the smallest Acmes around. This place is an absolute goldmine in the summer months and has no competition in the area. I'll never forget the first time I saw this type of sign on a store. It was way back in the early to mid 90's. 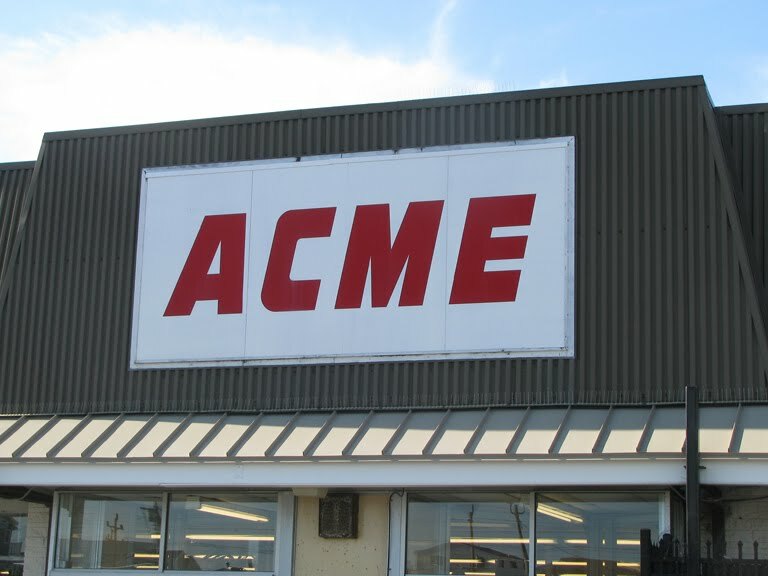 I couldn't believe this was Acme's new logo. Especially since it's not much of a logo and seemed like such a step backwards after the company's iconic fish-eye logo and red oval logo. The signage would be a million times better if the colors were reversed as is commonly seen on the street signage. You can check out an example here at the Clayton store. 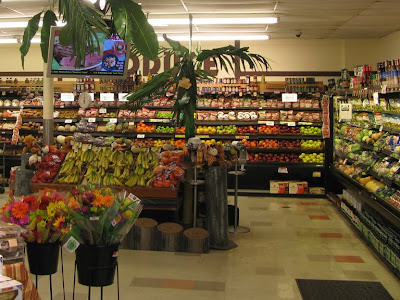 Produce alcove. Most likely added during the 70's remodel. I haven't been to this store myself so I can't make the call for sure but 50's stores usually weren't built with an alcove. It may have even been added later than that according to the Produce sign on the wall. If you look through the palm trees you'll see that the letters are from the Checkerboard Arch decor package but are painted brown. This store also has a unique tile pattern on the floor. Palm trees are used as decor throughout the store. 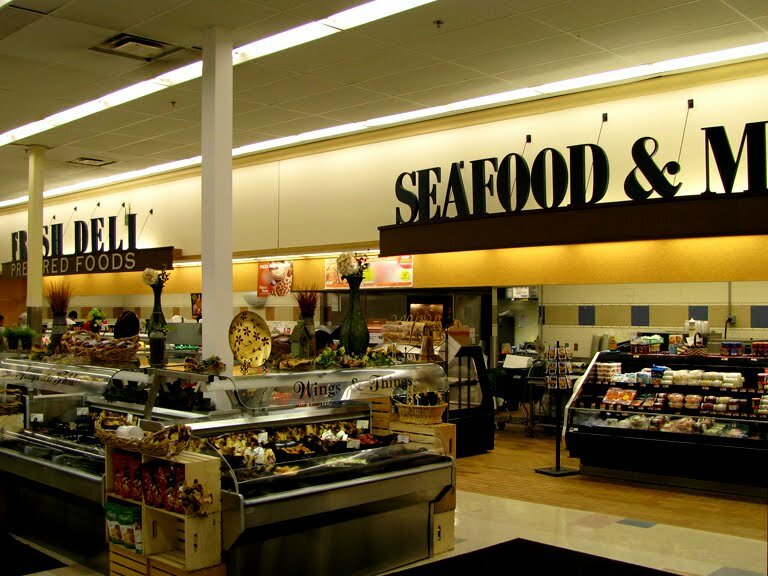 A very unusual aspect of this Acme is the incredibly low ceiling. 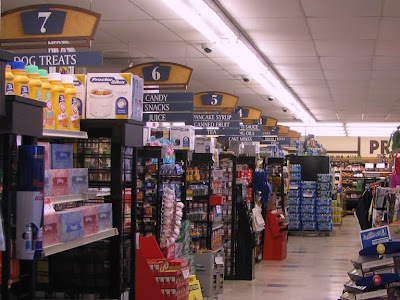 Acmes of the 50's generally had extremely high ceilings, even in very small stores. 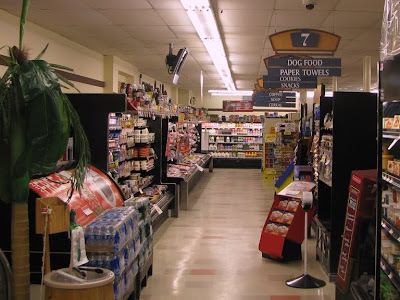 The aisle markers were most likely taken out of a closed store and put here. They look gigantic. This shot has already been seen in the 70's Colonial Decor collection. Amazingly, the type treatment on the wall remains after all of these years. Looks as though this store doesn not have a fully functioning Meat Department. The meat case is quite small and appears to only have prepackage products. 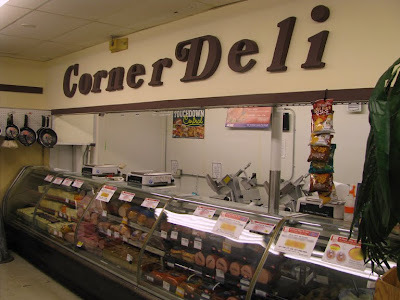 Like the Deli, the meat signage is left over from the 70's. "Lancaster Brand Meats" which was usually spread across the entire back wall of stores, is very small here. 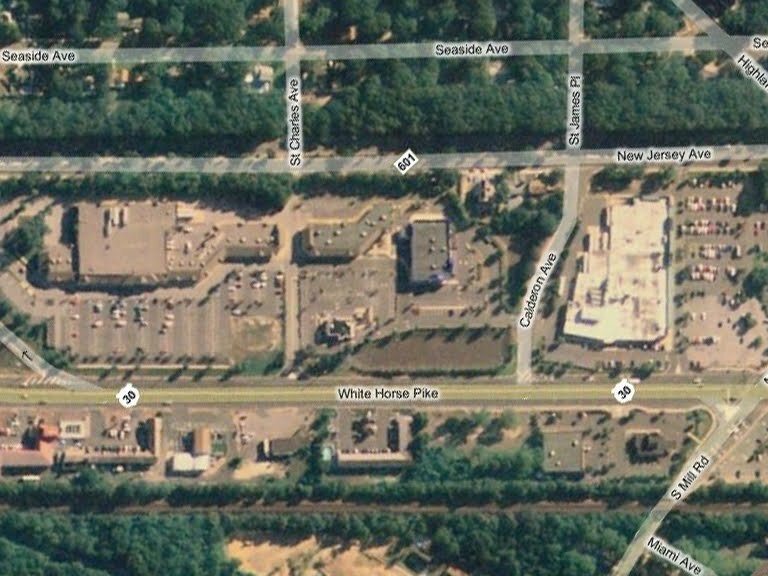 Check out the pickle barrel in the lower left-hand corner! You don't see those around too often these days. 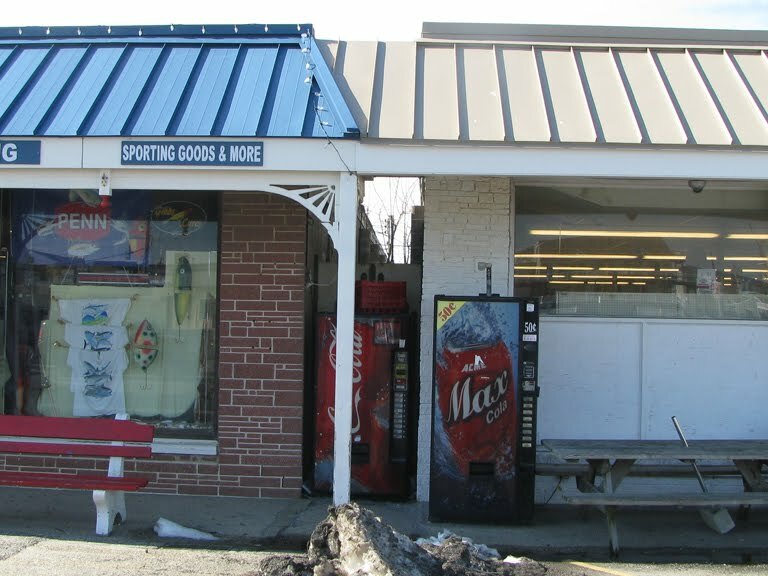 Like other small Jersey Shore stores, the sidewalk is closed in to allow for additional merchandise in the summer months. 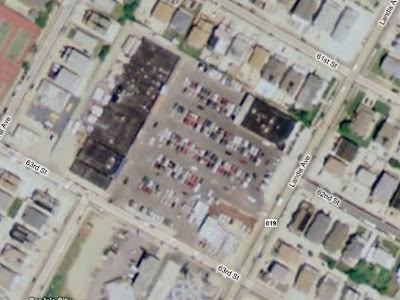 Rob got this interesting shot here to show that the Acme is a separate building from the others in the strip. 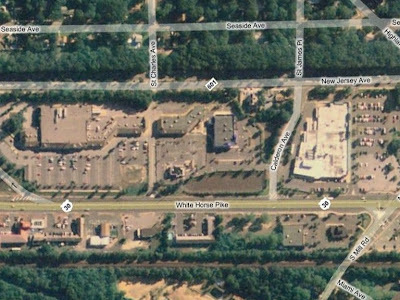 The building in the front of the parking lot hasn't arrived yet. The parking spots were angled in the 70's. 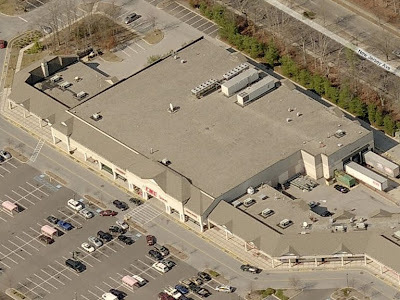 The shopping center has been built. Still alot of undeveloped land. The Acme has yet to arrive as of 1956. 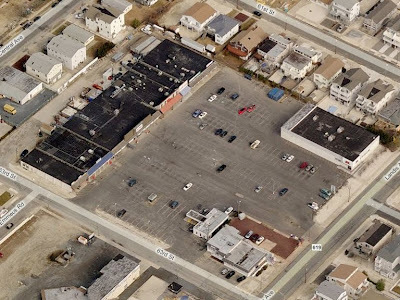 Huge parking lot but this one actually gets filled in the summer. Some interesting facades on these stores. Lots of storage rooms have been added on to the back of the store. 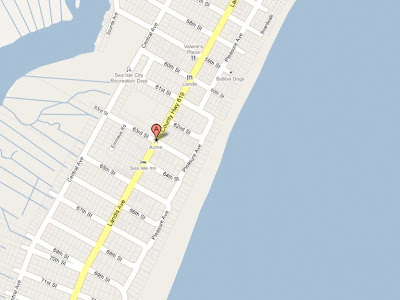 Looks as though truck deliveries are pretty challenging here. The beach is just a quick walk from this Acme! Sea Isle City is virtually deserted during the winter months. Check out the crowds in the summer! 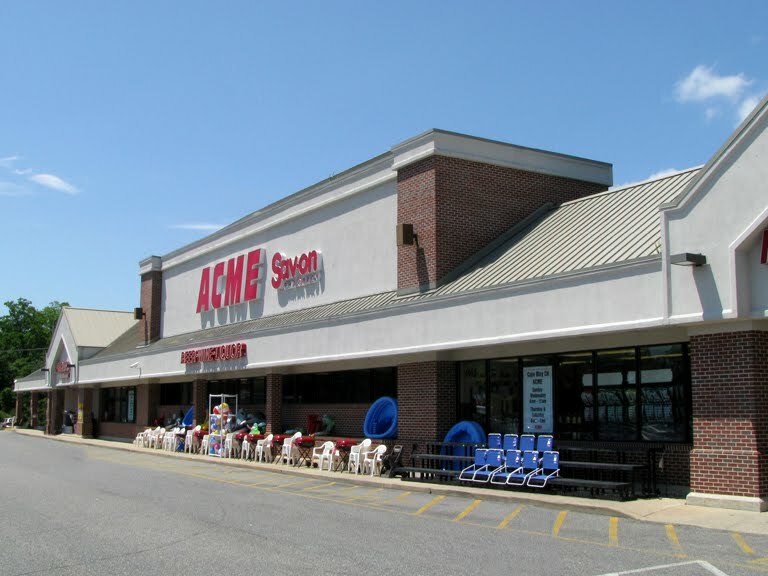 The Cape May area of New Jersey has four Acme Markets. We've already visited the old pitched-roof store in Cape May and we're now moving on to this Acme located in the small town of Cape May Court House. The two other locations will, unfortunately, have to wait until next summer's tour. 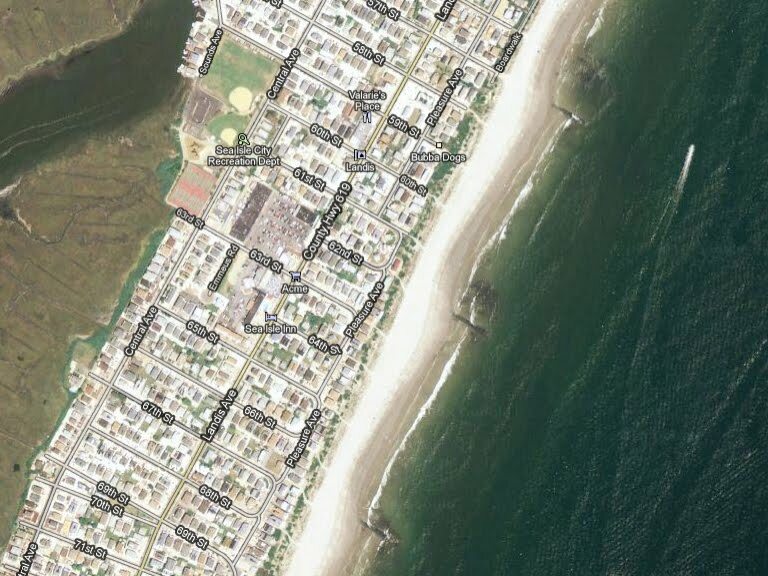 This year's Jersey Shore Tour cannot be extended and must come to end by Labor Day Weekend. 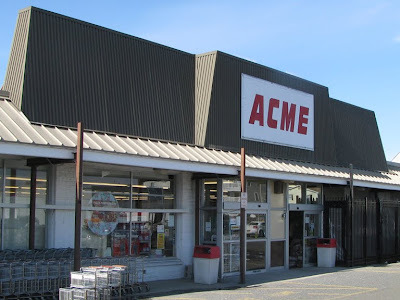 As we will see below, this building did not start out as an Acme. 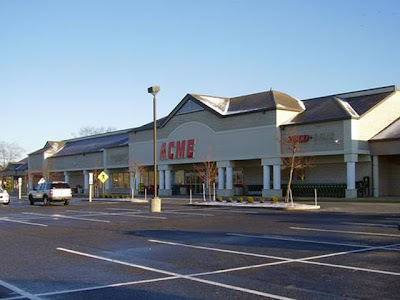 The Acme was originally located at the other end of the shopping center. 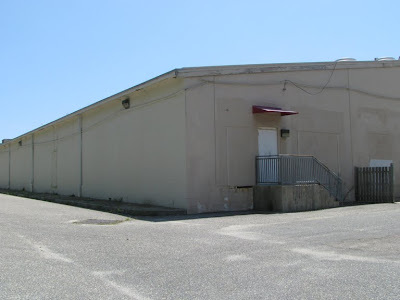 The facade seen here was used frequently during the 90's on stores that were remolded and expanded. I'm not sure if there were any brand new Acmes built with this exterior look. All the stores that I have researched with this look were older Acmes that were given significant make-overs. 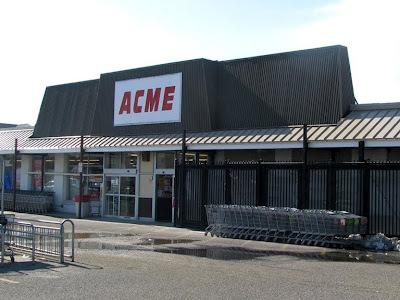 If anyone knows of any Acme's built from the ground up with this facade please let us know in the comments section. 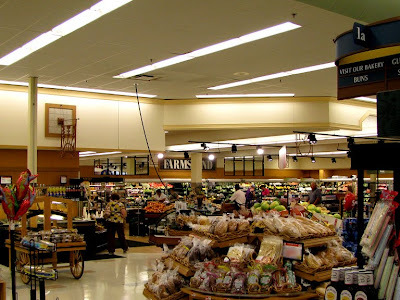 The interior here is the basic Albertson's Marketplace decor. 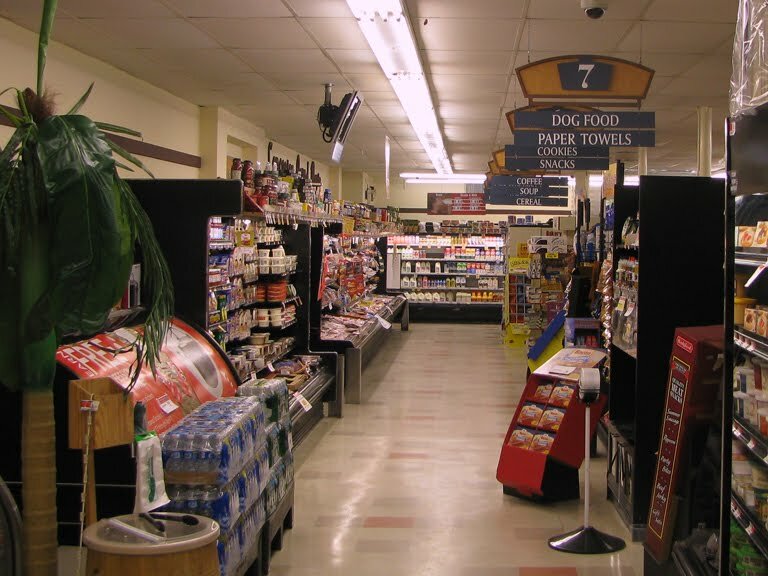 The floor tiles indicate that this store started out with the 90's Red/White/Blue decor package. Among other elements missing in the basic decor package are the blue light boxes on the walls above the service departments. The color scheme here is also lighter than the original Alberstons look. The aisle markers here match those of the Industrial Circus Decor. 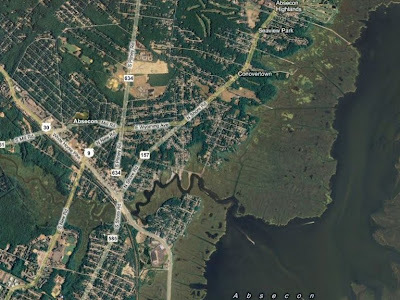 You can see an example from the Tuckerton store here. 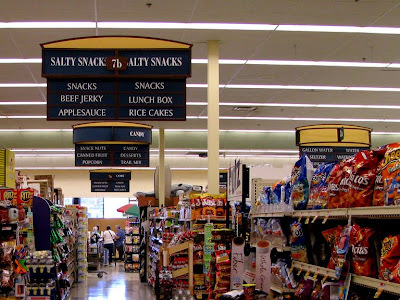 I have seen these aisle markers in other Albertson's Marketplace stores. 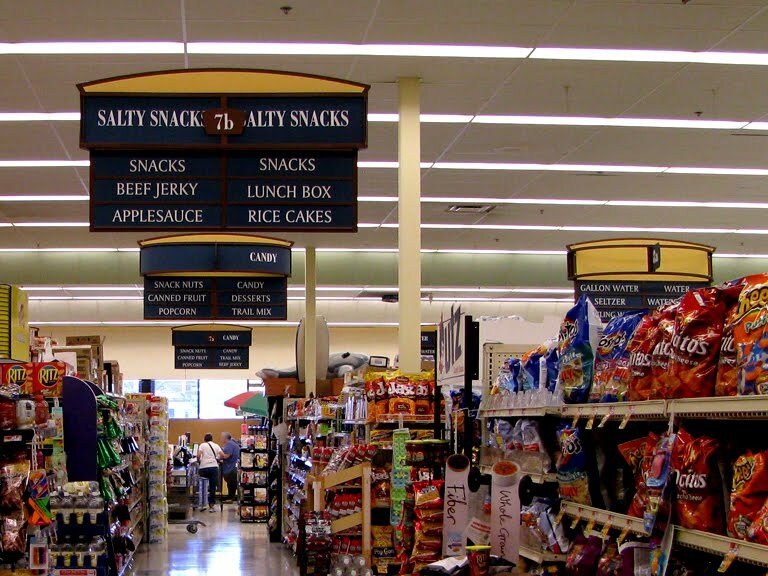 So the question is... did they carry this design over to the newer decor package or were the Industrial Marketplace aisle markers upgraded to the new look? Notice too how the slope up on the ceiling is painted a light green. This slope is very common in stores built or remodeled in the late 80's throughout the 90's. Most stores now have this slope painted green which makes for a very nice effect throughout the store. "Beer • Wine • Liquor" along the awning. One of the few Acmes that carry alcohol. I believe this is more common in Maryland and Delaware stores. Big selection of beach supplies here too. 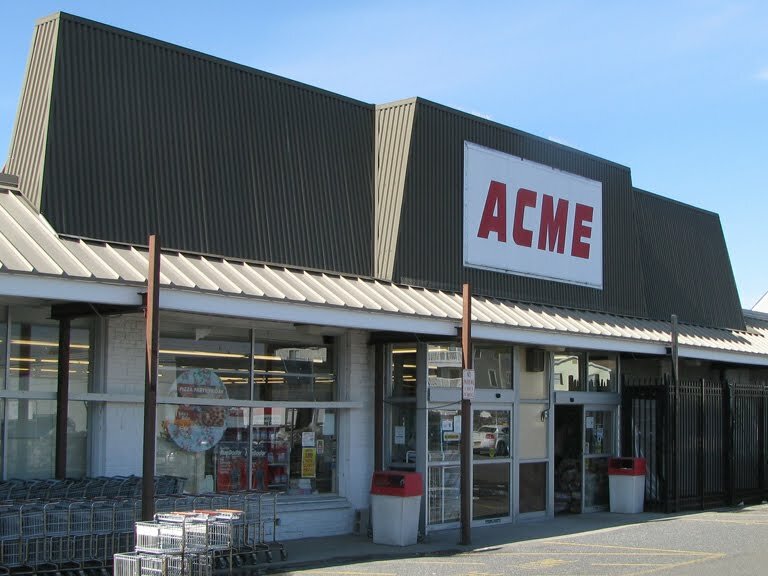 And the original Acme at the other end. 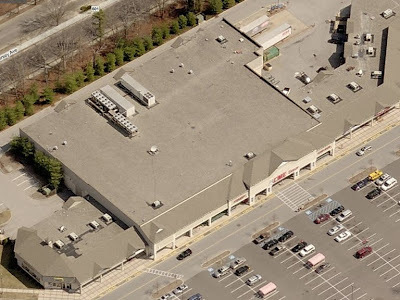 A former pitched-roof store that has been morphed into the shopping center. We'll see down below how the old pitched-roof was stripped down to just the walls and roof. Now a Marshall's. 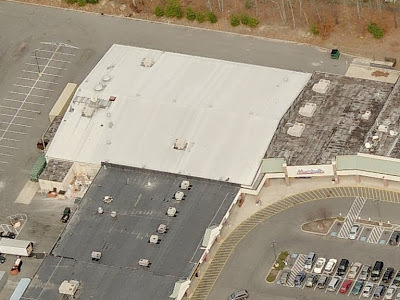 It may have been other stores over the years judging from the scars on the back of the store. Peaked roof still visible from the parking lot. Many of the former Acme's features in the back have been removed over the years. Looks as though the back has been reconfigured a couple of times now. Missing too is the section that normally sticks out of the top of the pitched section. 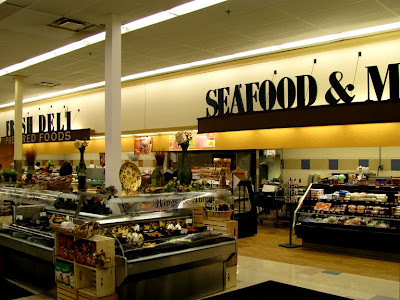 These sections usually remain when stores are converted for other uses. 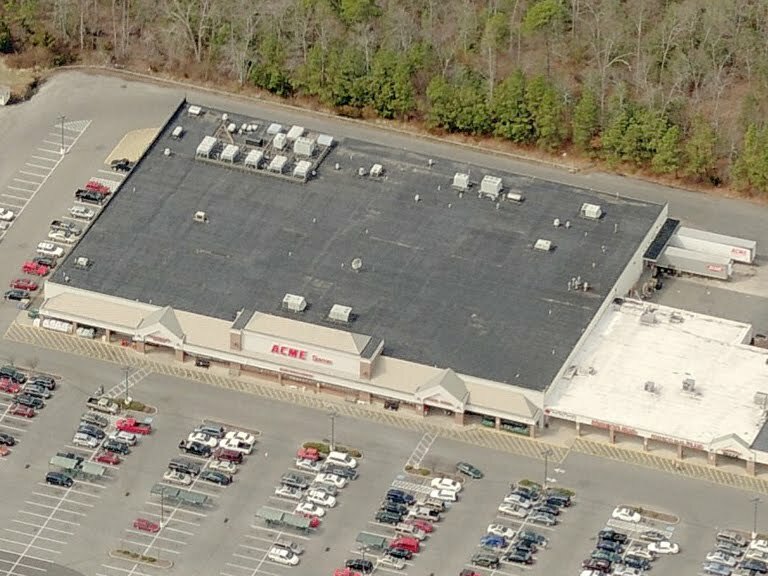 Back in 1995 the Acme appears to still be in the pitched-roof building. 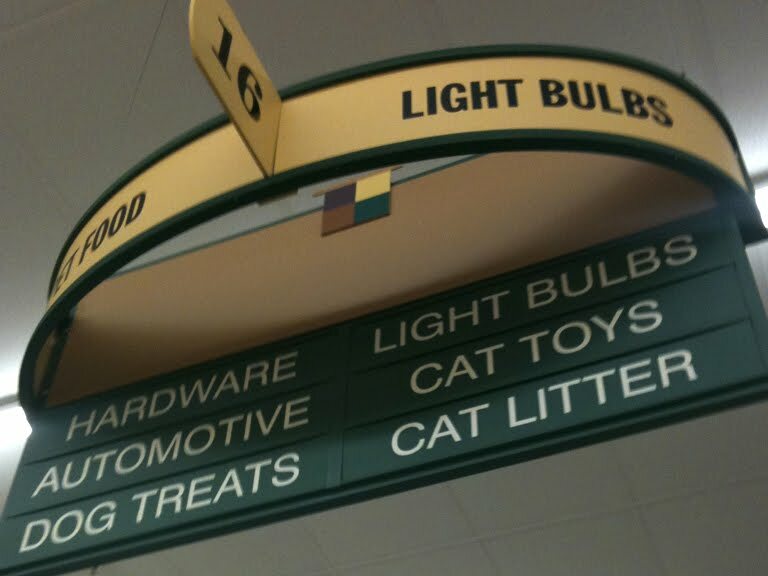 Perhaps the larger store is a Kmart. I would guess maybe a Jamesway but the chain was gone by 1995. UPDATE 8.26.10: Jamesway was officially out of business by December 1995. 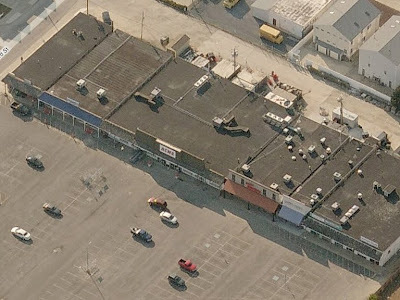 According to a comment from Bill, this building was a Jamesway and Acme opened in the location on June of 1996. Interesting to see a trees in 1970 with a pitched-roof still on it's way. That store model had been retired by the 70's. 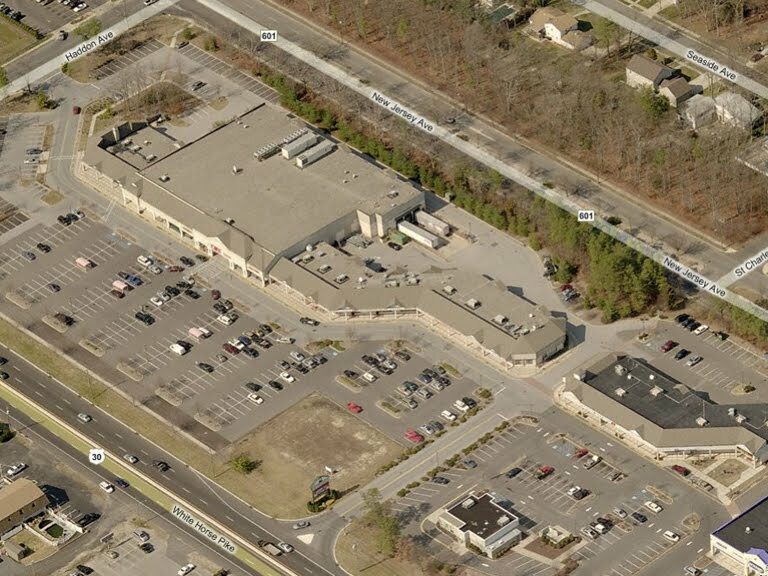 Maybe the shopping center had been planned by this point but not yet constructed. Super Fresh right across the street. 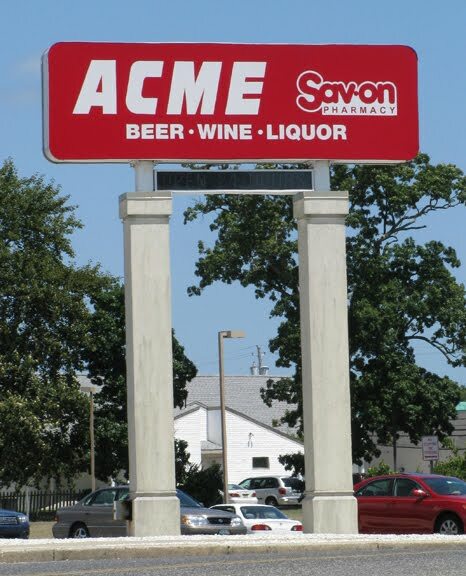 Much smaller than the Acme. The Abescon Acme closed on February 21, 2008. Not quite a crash and burn situation... but close. It lasted a little over 8 years. The location began as a Super Fresh which had an even shorter run... opening around 1995 and closing in early 1999. 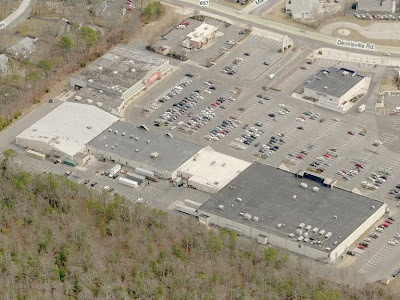 Why did these stores struggle at this location? You guessed it... ShopRite. 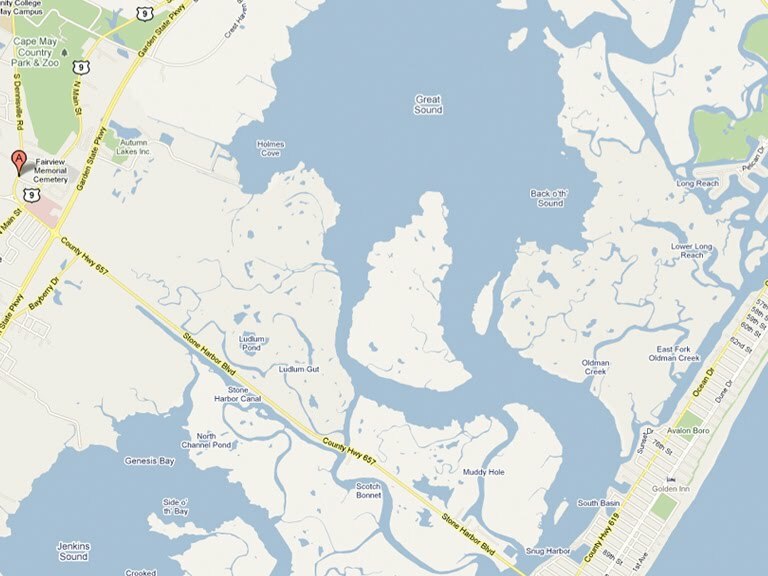 This post unfortunately relies completely on satellite images. 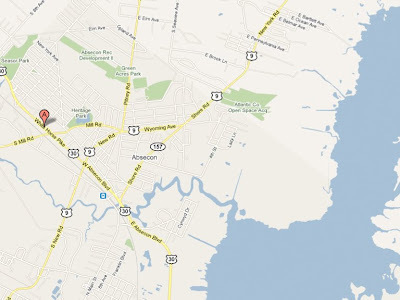 It's not my favorite way to present an Acme on the blog and it is done only as a last resort. What makes this one even more painful is that a valued Acme Style contributor took pictures of the abandoned store, as well as some interior shots, and sent them in many months ago. I lost the pictures. Apparently did not file them and have no email records since I downloaded the photos from a link. The person who sent them does not have backups... so we're outta luck. The satellite images do the store justice and the story here is too interesting to let go unreported. 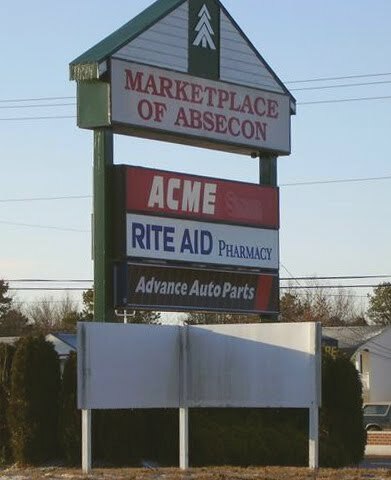 The Absecon Acme opened in the fall off 1999 and was the very first new store to open after the merger of American Stores and Albertsons. 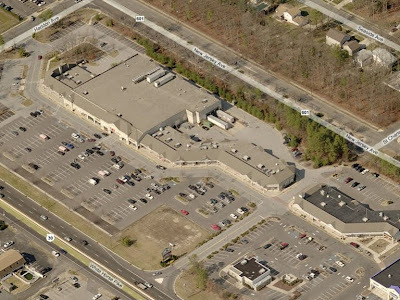 This location was billed as a "Superstore" although it clocked in at only 45,000 square feet. A much smaller size than Acme built throughout the 90's. It did offer a Sushi department, Coffee bar and... a reading center! 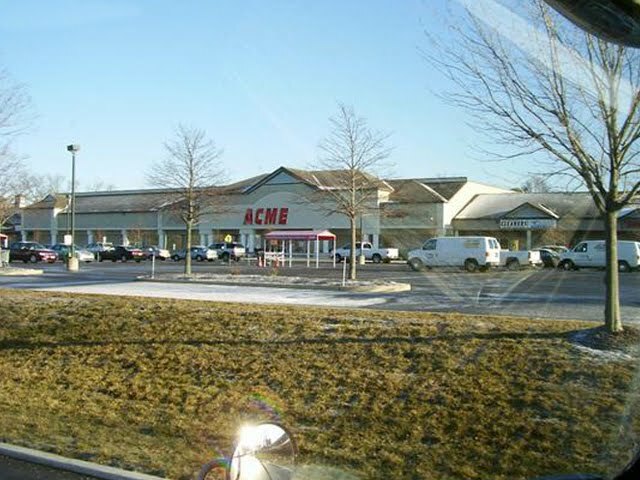 At the time of this store's opening, Acme was 165 stores strong. As of today, 42 of those stores are no longer. Acme left the Super Fresh facade intact, which would be easier to see if that tree wasn't blocking the view. 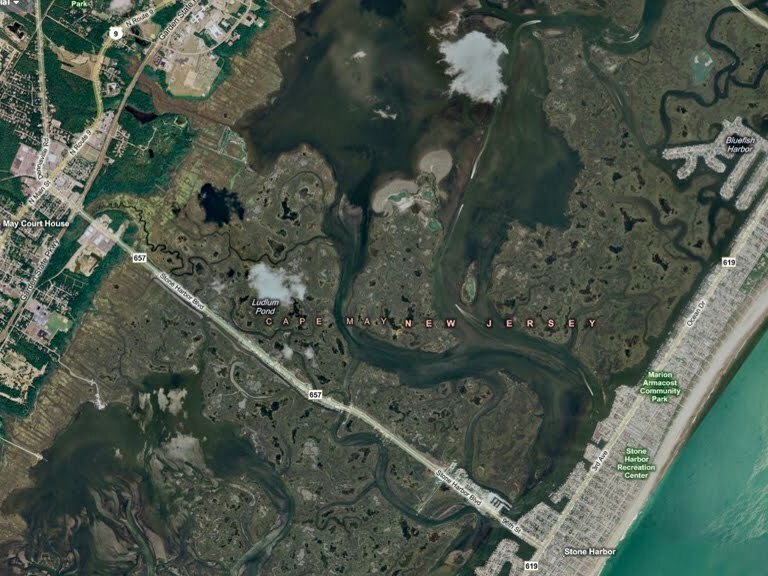 This was the clearest shot I could get from Google Maps. I believe it's been established on the blog that the Marlboro store was built as an A&P but Acme wound up opening at the location. 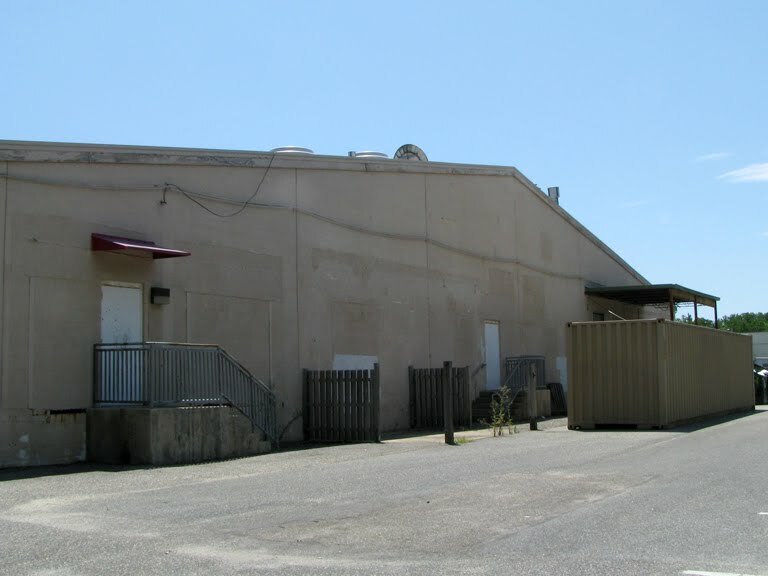 If you click here you can see how the two facades are virtually identical. 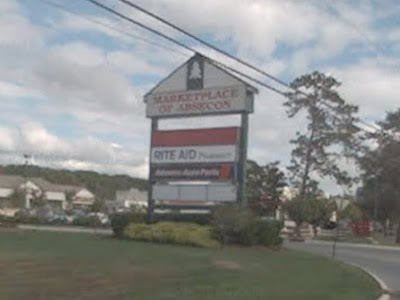 "Marketplace of Absecon". Acme's sign covered in red. 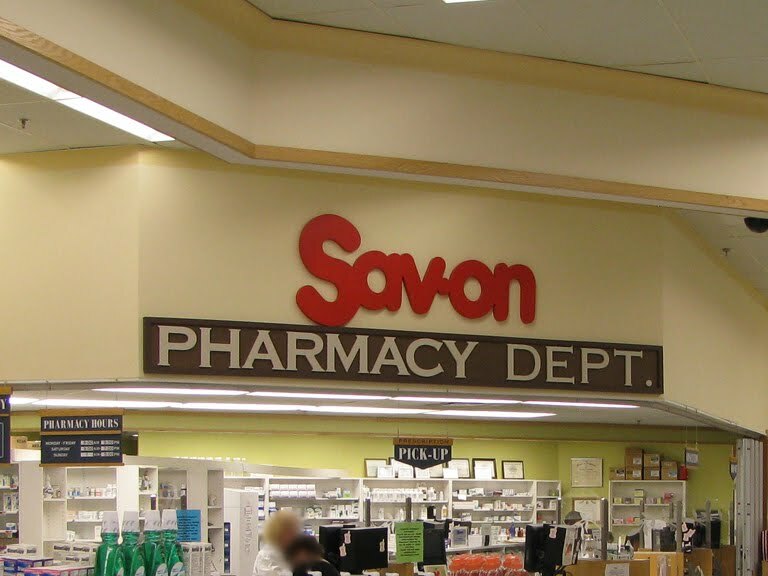 "Sav-on" and "Drug" signage already removed. In it's final days the Acme had become the "CME". The red cover for the letter A... gone. The Acme has recently been subdivided into 3 separate stores including a liquor store and Dollar Tree. As of November 2009, the third space had not been leased. The StopRite literally next door. 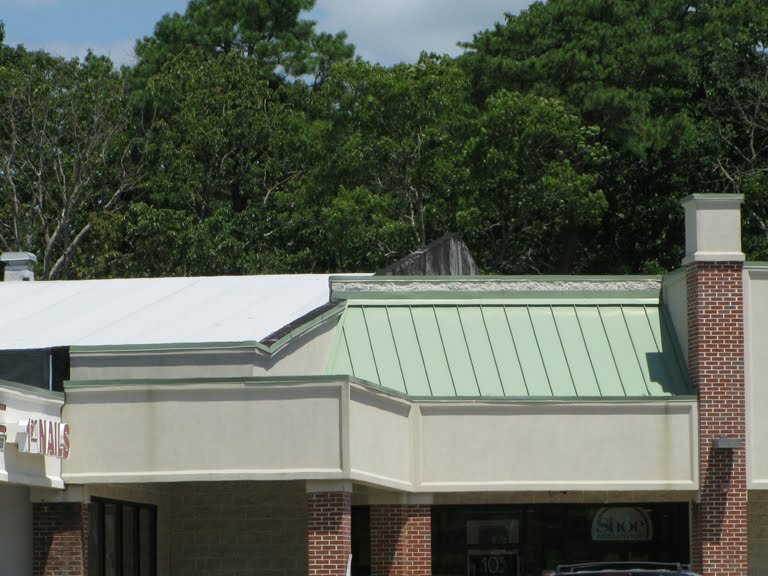 As you can see here, this store appears to be have been made up of a hodgepodge of buildings over the years. The historic aerials shots of this property have me pretty confused. Very early images show what appears to be some kind of store. Was it a grocery store? Was it always a ShopRite? I can't tell for sure. We'll look take a look at the old aerial shots below. You can see above how close the the two stores were to each other. We'll start in 1957 and work toward the present. 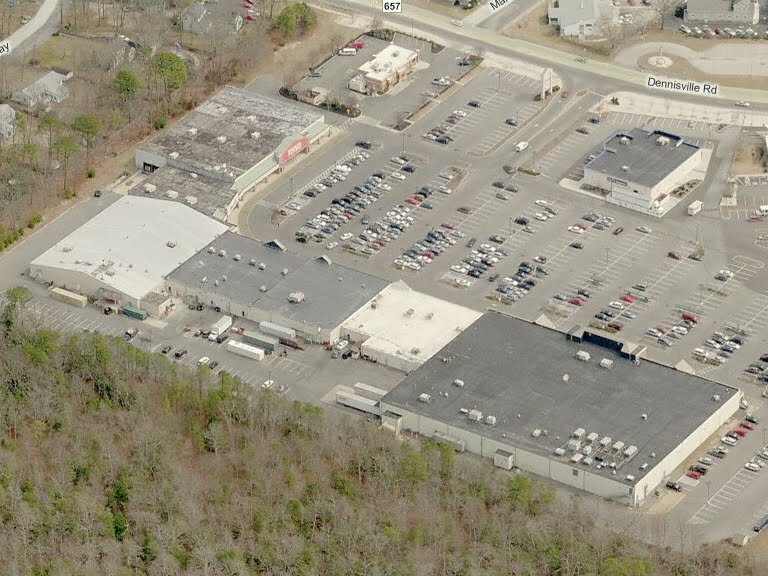 This image seems to show the original "ShopRite" building on the property. No indication of what it could be. 1963 and the building has more than doubled in size. Definitely looking like a store at this point. 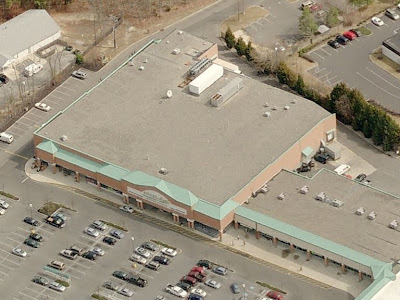 Was it a ShopRite way back then? Very busy store back in 1970. Looks as though the Super Fresh has just been built. 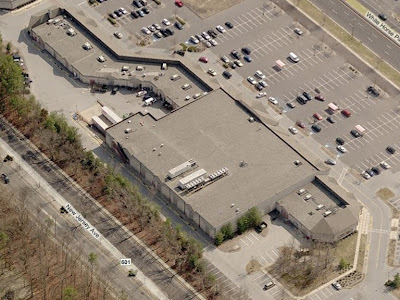 The strip mall is still under construction. 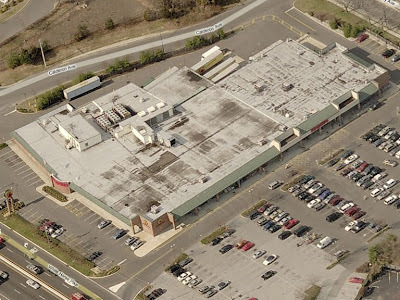 If you click the link you can also check out the state of the ShopRite. Still the same size as the 1970 image, yet not a car in the parking lot. 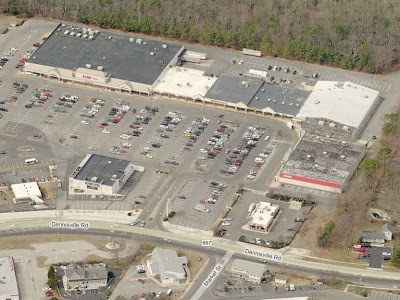 Perhaps ShopRite has yet to move in. 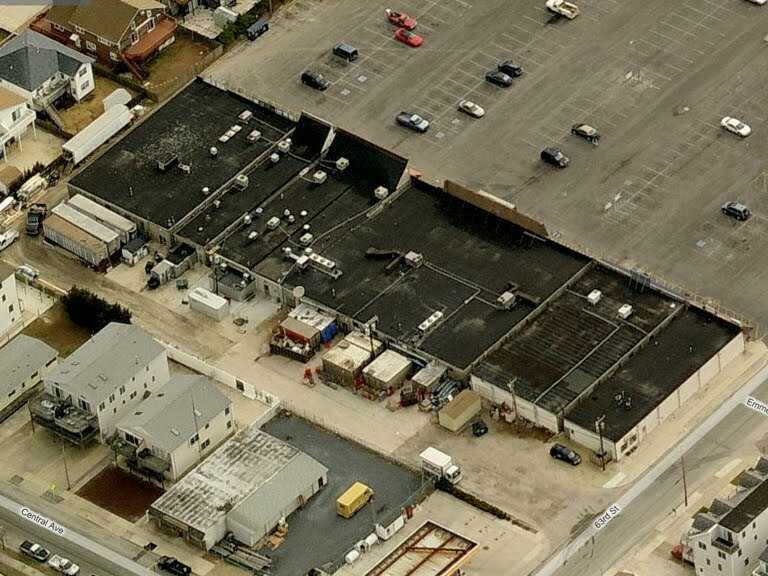 The back lot has been cleared and the ShopRite has been expanded yet again. 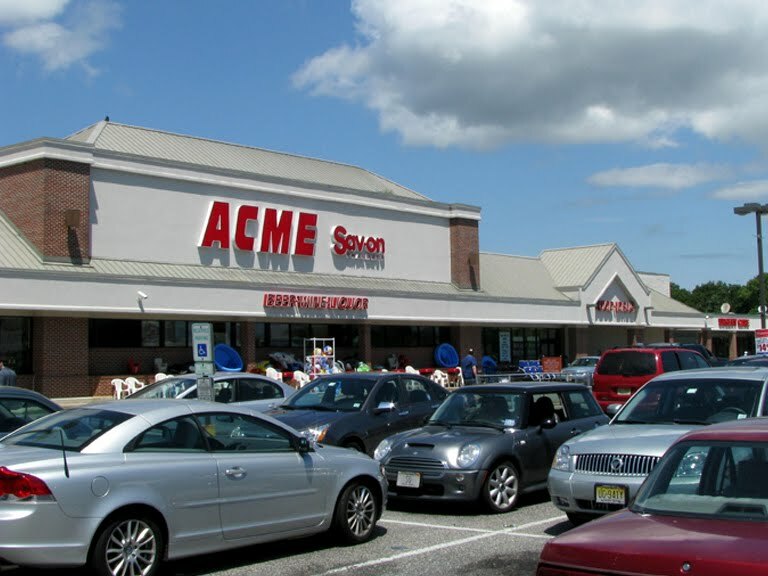 The Acme has a fraction of the cars in it's parking lot as the ShopRite. 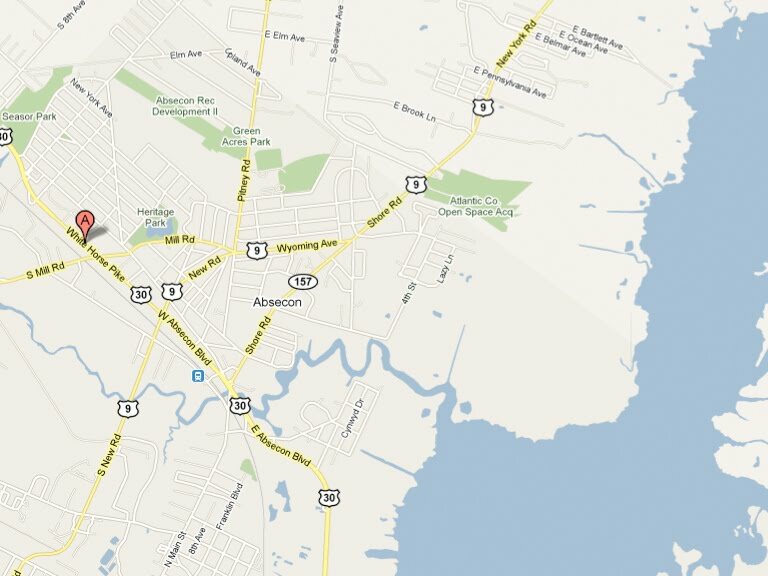 Absecon is located down near Atlantic City. It's not quite a shore town but definitely on the way to the shore! 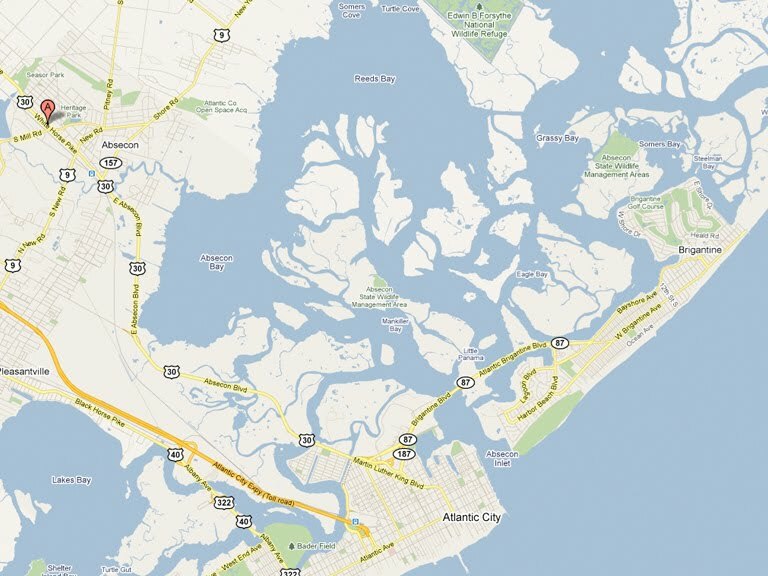 Here you can see Absecon's relation to Atlantic City. 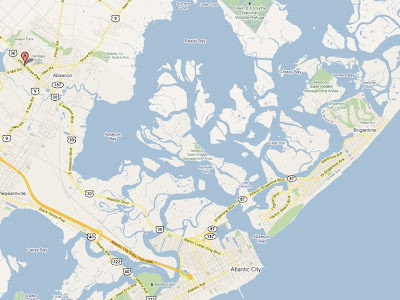 Brigantine, which is north of Atlantic city, is home to an Acme which we're not going to get to on this tour of the shore. 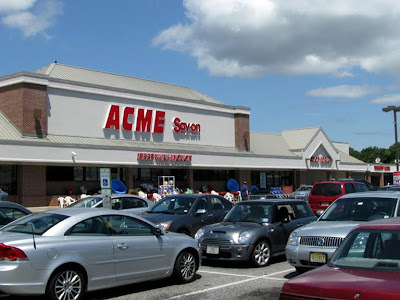 It's one of the newer stores in the chain but like Absecon, Acme took over after another chain left.